Born in the East End and the son of a taxi driver, McQueen got his training in tailoring in Savile Row, eventually making suits for Prince Charles, and won the distinction of being named British designer of the year four times between 1996 and 2003. He went on to be awarded the CBE, as well as being named International Designer of the Year at the Council of Fashion Designer Awards. McQueen became the 'enfant terrible' of the fashion world after he was famously discovered by Isabella Blow, who was fashion director of Tatler. She bought all the clothes he made for his graduate show for £5,000 and they were delivered to her in black binliners. Miss Blow killed herself in May 2007 after taking an overdose of weed killer after being diagnosed with ovarian cancer. She had attempted suicide several times by then. McQueen was forced to deny rumours of a rift between the pair at the time of her death, saying: ‘It’s so much b******s. These people just don’t know what they’re talking about. They don’t know me. They don’t know my relationship with Isabella. It’s complete bull****. McQueen was so distraught by Isabella’s death that he dedicated his spring summer 2008 show at Paris fashion week to his late friend. The invites to the show were poster-size illustrations Richard Gray. It depicts a triumphant Blow, in a McQueen dress and a Philip Treacy headdress, in a horse-drawn carriage ascending to heaven. Miss Blow had said: 'My relationship with McQueen began in 1994, when I went to a Saint Martins graduate show. I couldn't get a seat, so I sat on the stairs and I was just watching, when I suddenly thought: I really like those clothes, they are amazing. It was his first collection. ‘It was the tailoring and the movement which initially drew me to them. I tried to get hold of him and I kept calling his mother, but he was on holiday. 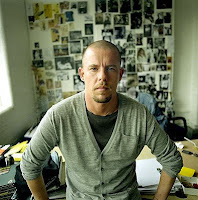 Born Lee Alexander McQueen, the designer was the youngest of six children. Openly gay, McQueen - who once described himself as the 'pink sheep of the family' - left school at 16 and went to work at Savile Row’s Anderson & Sheppard, whose clients included Prince Charles and Mikhail Gorbachev, after he saw a television program about the apprentice shortage in traditional tailoring. He went on to work for Gieves & Hawkes, theatre’s famous Angels & Bermans costumiers, and then worked in Japan and Italy. He returned to London in 1994, hoping to work as a pattern cutter tutor at London’s prestigious Central Saint Martins fashion school. Thanks to the strength of his portfolio he was persuaded to enroll in the course himself. After graduating McQueen set up his own label based in the East End of London. With the launch of his 'bumsters' trousers with a waistband so low that the buttocks are revealed, McQueen made his label famous through tabloid headlines.